Yes, as the title suggests, we’re going to have another of those posts with math (and fun) in it. I was thinking the other day, what can we do while commuting for an hour or so, without internet and possibly without a laptop as well, just carrying an iPad with us. 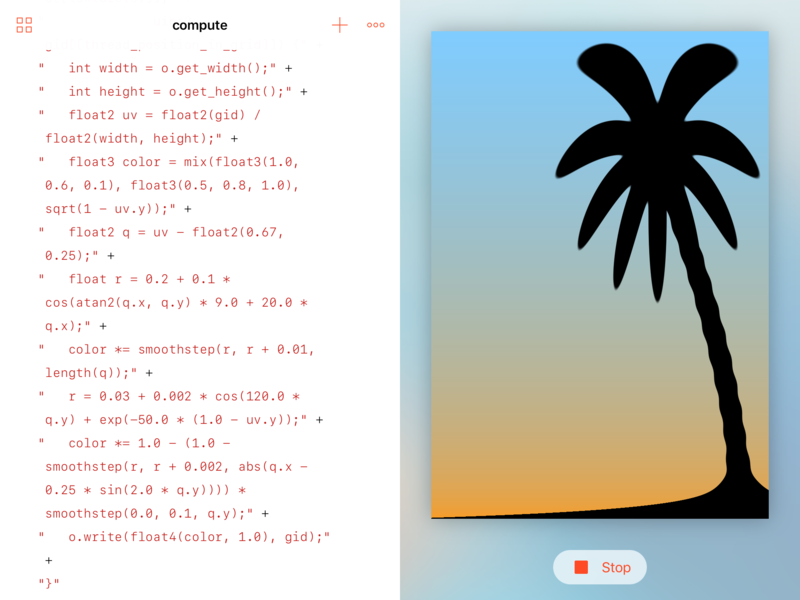 Luckily, the iPad now has the awesome Swift Playgrounds app. Let’s start with a new playground that runs a basic compute kernel. Since the current version of the Swift Playgrounds app does not yet let us edit the Auxiliary Source Files, where all our Swift and Metal files usually reside, we will have to write our code in the main playground page, but it is not that complicated. All we have to do is modify our MetalView initializer and let it take in an extra argument – our shader/kernel code. Then we start building our code by adding more lines to this long string. I want to say thanks to Inigo Quilez again, for keep inspiring me to write more and more about drawing with math. All the math in this tutorial belongs to him. The source code is posted on Github as usual.